New build house prices rose on average by 5.6% in June 2016 according to the latest LSL Land & New Homes Index - the same rate as recorded in May 2016 - yet 1% down on figures released in June 2015. 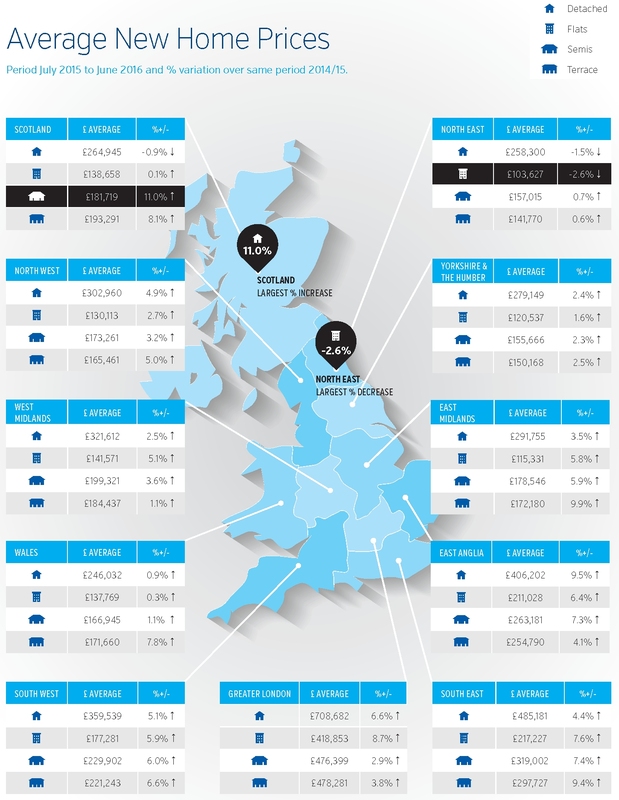 And while similar price rises were seen on a regional basis - up by an average 3.9% - it is Greater London, once again, that has seen the highest price growth at 8.2% - down, however, on last years’ figure of 11.6%. "As new build prices continue to rise it is clear that, despite initial concerns raised following the referendum result, there is strong demand for new builds and that in some regions prices have risen quite considerably across all property types. In the North West, for example, which retains its position as one of the best performing northern regions; average growth of 4% was recorded in June with detached properties, in particular, recording 4.9% growth in prices – up to £302,960. In addition Scotland saw a big climb in the price of new build semi detached properties – up a massive 11% to £181,719. In contrast, and yet still in the northern region, it was the North East that actually saw price reductions in June – particularly for detached properties as well as flats which were on average 2.6% lower than May 2016 - down to £103,627.In terms of the greatest movement, however, it was yet again Greater London who retained the lead over other regions – with an average increase of 8.7% in the price of a flats – to £418,853 followed by detached properties which rose 6.6% to £708,682. A massive difference compared to the price, for example, of a new build detached property in Wales which stands at just £246,032.